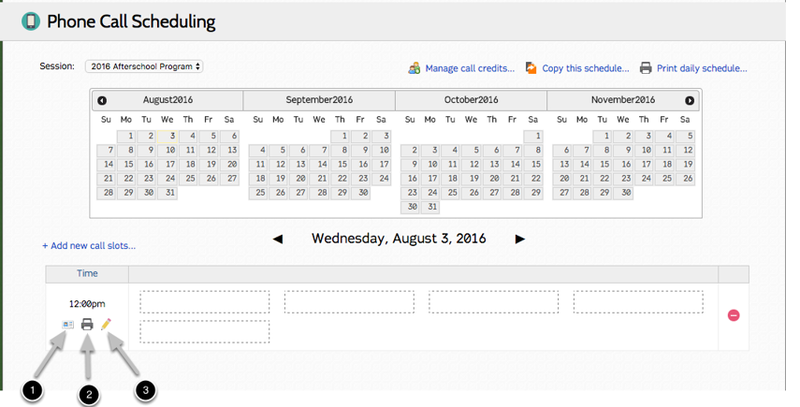 Click "+Add new call slots..."
Click "Add new call slots"
The new call slot has been added. Click "+Add new call slots..." to add additional phone call slots for the day. Click to toggle camper details for the phone call time slot. This will display the camper's profile photo, division, bunk and phone number they should call. Click the printer icon to print a list of Campers assigned to this call slot with details about the call type and the number they should call. Click the yellow pencil to set blackouts during the phone call time slot.